The flood of live music continues this week in many forms, from straight-up concerts to movies with live soundtracks and a big blow-out of a music festival out in Pudongland. Jazz at Lincoln Center brings the Aaron Goldberg Trio with Jennifer Sanon for post-bop jamming, British superstar DUA LIPA lands at the National Exhibition and Convention Center, the Shanghai Oriental Art Center does back-to-back movies with live orchestral accompaniment, the Stallion World Music Festival blows through with steppe-rock, Canadian prog-metal band INTERVALS hit Yuyintang, and Concrete & Grass blows up the rubgy pitch with piles of international and underground favorites. Phew! 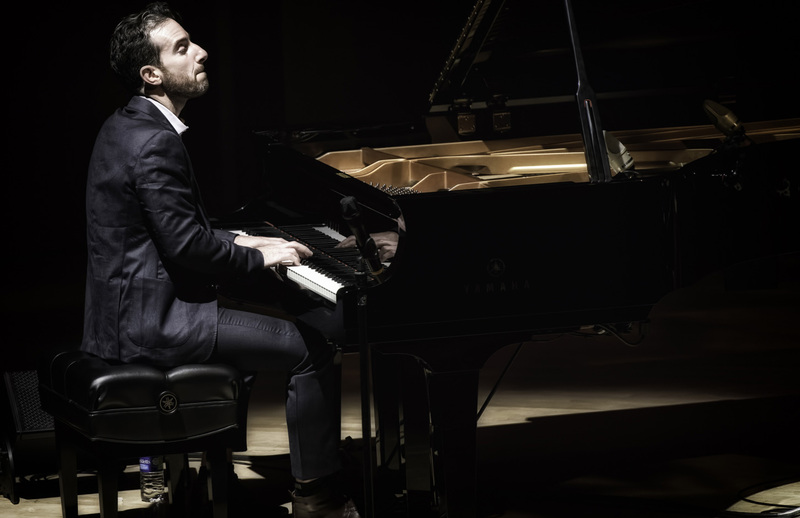 Aaron Goldberg is an American jazz pianist described by The New York Times as a "post-bop pianist of exemplary taste and range," with five albums to his name as a solo artist a host of collaborations with the likes of Joshua Redman, Wynton Marsalis, Kurt Rosenwinkel, and Guillermo Klein, among others. Tickets here! British superstar singer-songwriter Dua Lipa is bringing her hotly-anticipated debut tour to Guangzhou and Shanghai in September. Now the most streamed female artist on Spotify, and hot off 8 weeks on UK's #1 for "One Kiss" with Calvin Harris. Tickets here! In the very early days of film, movie soundtracks were performed live in the cinema, sometimes just by piano, sometimes by a full orchestra. Keeping with that legacy, the Shanghai Philharmonic Orchestra, conducted by Ernest Van Tiel and with Eleanor Grant as soprano, will be performing a live accompaniment 1996's Academy Award-winning romantic war drama. .Tickets here! The Stallion World Music Festival brings steppe-rock straight out of Tuva, once of the most isolated places on the planet, during the Soviet era, with three rock bands re-imagining their musical heritage. Tickets here! the Shanghai Philharmonic Orchestra, conducted by Ernest Van Tiel and with Clara Sanabras as soprano, will be performing a live accompaniment of James Cameron's 1997 romantic epic, which follows Jack and Rose as they overcome social classes to engage in a whirlwind love affair aboard the most famous cruise liner of all time..Tickets here! Split Works' seminal festival experience Concrete & Grass reoccupies the Shanghai Rugby Field for two days in September, bringing in 60+ acts including the king of reggaeton Daddy Yankee ("Despacito" and "Gasolina" to name a few), fast-rising rappers YBN Nahmir and Rico Nasty, legendary Japanese underground figure Jun Togawa, shoegaze pioneers Slowdive, the ‘Japanese Jamiroquai’ SUCHMOS, American avant garde composer and producer Oneohtrix Point Never and more, more, more. Tickets here! Canadian progressive metal act INTERVALS, led by guitarist Aaron Marshall, have been working on the follow up to their 2015 studio album "The Shape of Colour," finally dropping "The Way Forward" in late 2017. Their guitar-driven sound samples a bit of everything. Tickets here!